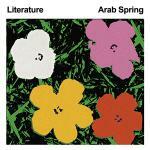 More information on Literature’s “Arab Spring” cover art – thanks to Warholcovers! “Curious to find out more about one of the most recent Warhol related covers, I was able to track down Literature and ask them a few questions about their “Arab Spring” record cover. Nathaniel (Cardaci, vocals/guitar – recordart’s note): Sometime after recording ” Arab Spring” I found myself at the Menil collection in Houston. They had a Warhol room at the time and as I walked in I saw Ten Foot Flowers on the far wall everything about it screamed POP and I knew at that point that I wanted to try to use some amalgamation of the image for the record cover. Kevin (Attics, guitar/vocals – recordart’s note): We did not attempt to contact them fearing that it might result in a legal obstruction that would push back the release of the record or disallow us from using the cover. Kevin: Nathaniel and I have an abiding fondness for NYC Culture running from the late 60′s to the mid-80′s. That period is obviously indebted to Andy. That we are influenced by bands he showed a great enthusiasm for might be why we felt his work was a great visual complement to our music. So, as we surmised the album art is not a Warhol picture at all, but a new montage of four hibiscus flowers on a new background of grass by Jordan Shade and Kevin Attics to resemble Warhol’s famous “Flowers” painting – a true homage to great art!.